Breathe in the fresh and let the starry nights be your company as you spend a night at camp Riverside. 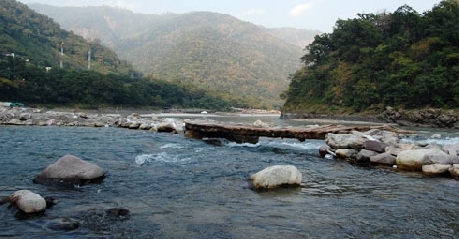 This hotel is located near Shivpuri Beach that offers direct access to the Ganges, the hub of river rafting. The camp site is easily accessible via the road that ends at the camp’s parking lot. Kerosene lit lamps accompany your nights and offer a local and very adventurous experience beneath the stars sitting around the organized bonfire. 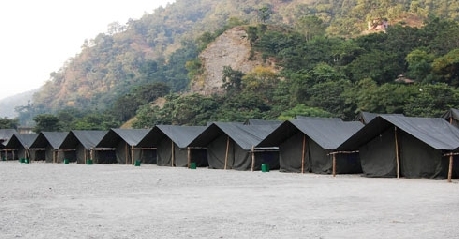 The camp expects its visitors to come prepared with a few things before staying with them like flashlight, comfortable casual clothing, comfortable footwear, sunglasses and personal toiletries and medication. 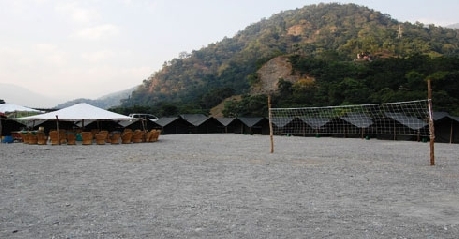 The camp organizes adventure sports especially river rafting. 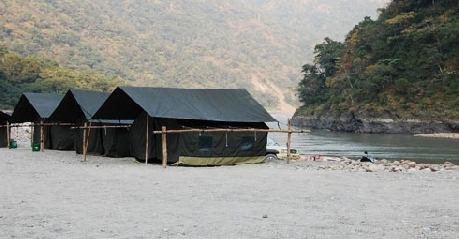 The camp offers a standard category camp that is spacious and comfortable. A dining tent is also located within premises. 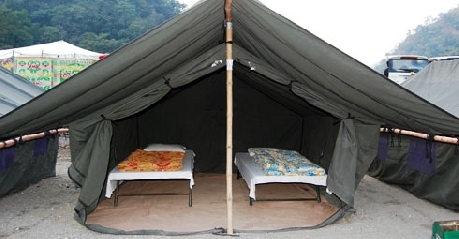 Standard camps are spacious abodes that are furnished with comfortable twin beds. The twin beds come with comfortable quilts and mattresses. The natural stream flowing nearby and the mountains offer your company and the first rays of the sun welcome you. The sound of the birds makes up for the morning music. 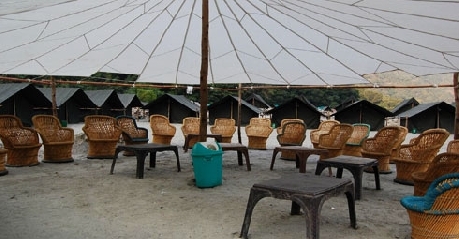 The camps come with common washrooms both western and Indian. The washrooms are supplied with running water. Kerosene Oil lanterns lend a romantic glow at night. The camp site has an in-house kitchen in the dining tent that offers Indian and International cuisine. The chef charters out delicious and lip-smacking food that is sure to leave your senses heavy with the aroma of tasty food and your stomach quite happy.